Alice Hlidkova is an international freelance journalist currently based in Brooklyn, NYC. Her work appears regularly in the international press, for publications including The Christian Science Monitor, Ragmag and Beyond. She has also been published in The New Scientist, Doha Centre for Media Freedom, and Arab Media & Society. She speaks and writes in English, Czech and Spanish. Highly attractive from a distance, spirit-shattering when seen up close, the city of Salvador juts out into the Bay of All Saints, stretching clear across the Atlantic Ocean into the palms of Yoruba culture, into modern-day Nigeria, Benin, and Togo. Once the dark, colonial capital of Brazil is today a cheerful, modern city of more than two million. Most of the colonial treasures are scattered in The Upper City, perched atop a high bluff, overlooking the bay and industrial buildings of the Lower City. The Lacerda Elevator, in all its Art Deco splendor, connects the two. When African slaves first arrived to the marketplace, “Mercado Modelo” with their arts and crafts, and strong postures, they took the elevator up through rugged terrain, disembarking in the Upper City neighborhood of Pelourinho, “The Pillory.” They set cobblestone in the street ways and coated municipal buildings in plaster, in softened stucco, before carving out Baroque and Rococo ornamentation. 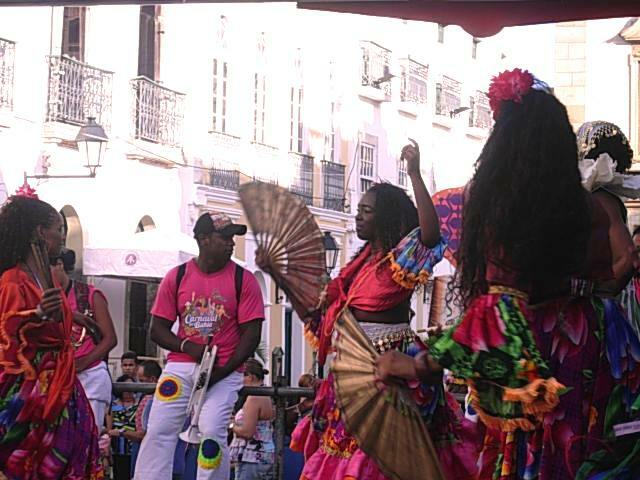 In the center of their colonial capital, on the main square of Terreiro de Jesus, they built The Museu Afro-Brasileiro. 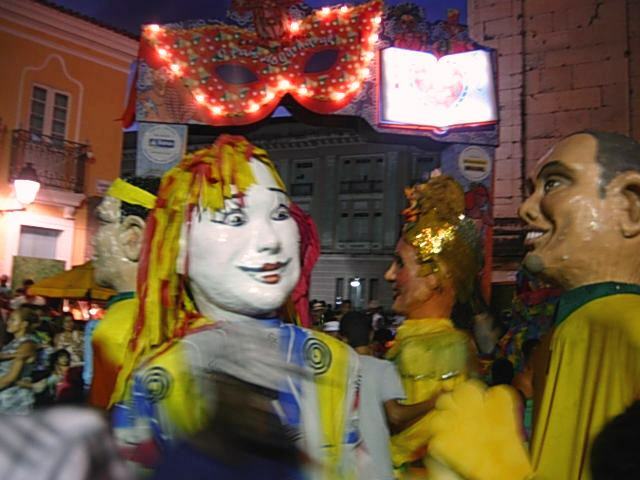 Within its pallid hallways hang postcards of Bahia’s unique Afrocentric culture, touching upon Candomblé, Capoeira and carnival. 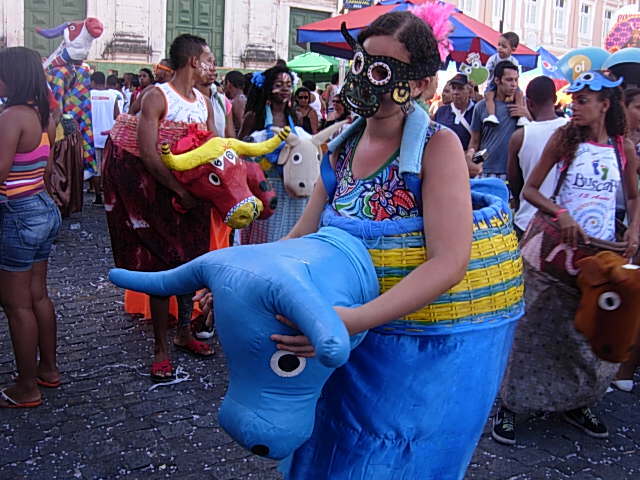 Candomblé draws inspiration from the African Diaspora, but it mainly features aspects of Yoruba Orishá veneration that is associated with Roman Catholicism. Capoeira, a Brazilian mixture of nonviolent martial arts, interactive dance, and musical comedy, was adopted during the transatlantic slave trade. The cultural dance of spinning, acrobatic bends, leveraged by legsweeps, and accompanied by percussion instruments, traces its flow from Bahia to Berlin, New York and Australia. 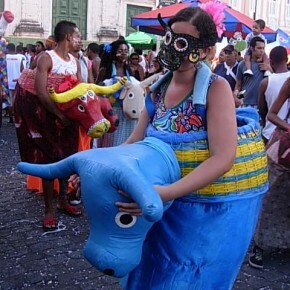 Carnival, rooted in the Saturnalia pagan festival, adapted to Christianity, not only became a farewell to bad things in a season of religious practice, but a showcase of samba schools dancing to Afrocentric music of frevo, maracatu, and samba-reggae. Beyond its complex, colonial history, Pelourinho evokes a certain fundamentalist paradise. On many of its pastel-colored street corners, slender townhouses slope down without warning, then ramp up with prominence into the sky. One minute the bulbous spires of the Igreja de Nossa Senhora do Rosário dos Pretos are at your feet; the next, sky-blue façades of another church, vibrate with the sounds of the Yoruban language mass. Local Jesuits, robed in white and blue fabric, smile endlessly, handing out beads during Carnival in hopes of stealing a kiss. Children grab hands nearby the azure tiles in the beautiful convent of São Francisco depicting Lisbon, before the earthquake of 1755. 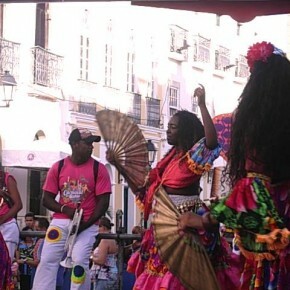 Everywhere samba and reggae accost visitors, who are too busy studying the immortal Renaissance architecture. Pelourinho’s stunning wonderland is acclaimed with the smell and taste of Bahiano cuisine. Racially-mixed “mulatas” commonly serve food fried in dendê. Reedy, young waitresses fry pastries and meats in the highly saturated palm oil for a crispier finish. Mixing dendê in traditional seafood stews loaded with onion, garlic, parsley, and hot-pepper sauce, and cooked in coconut milk, they send taste buds into overdrive. Bustier female chefs, dressed in traditional white headwrap and full dress, dish out their famous acarajés, deep-fried, mashed-bean sandwiches, filled with yellow porridge of shrimp, garlic, cashews, coconut, and more dendê. But the option of drinking cachaça, the national firewater made from distilled sugarcane, soaks many to the gills, flushing out their oil-coated tongues. The historic district is more or less policed; a decade ago knife stabbings were as common as selling acarajé. The Liberdade shantytown clings impossibly to a large eroding hill nearby, where roughly sixty percent of the population lives. The remainder flocks to the coast, to the wealthy neighborhood of Barra, bristled with sleek, heavily-guarded skyscrapers that evoke Miami on a shoestring. The calm inlet of Porto da Barra beach is like no other urban shoreline in the world. Set within the bay, Porto da Barra became Bahia’s first European settlement, Vila Velha, or the Old Village. Nearby Farol da Barra, is a surfer’s haven, where a great lighthouse was built, named after the Pharos Island off the coast of Alexandria, Egypt. Its lighthouse was named one of the Seven Wonders of the Ancient World. A dart thrown across the Baia de Todos os Santos (All Saint’s Bay) lands on the islands of Itaparica and Morro de Sao Paulo. The perfect crescents of white backed by shades of green are easily accessible by a short ferry ride. Across palm fringed sand, wealthier Brazilians built summer homes, sunbathing by day, driving four-wheelers by night. They paid reverent honor to their joyous city, “Capital da Algeria,” by toasting with cocktails of Caipirinha and singing into the early hours of the morning. In January, they extended their worship on the steps of Nosso Senhor do Bonfim, Salvador’s most sacrosanct church, where they washed the stone in dedication to Oxalá, one of the highest deities of the Candomblé religion. Many of them prayed and left their valuables inside the Room of Miracles, decorated with body parts, wooden and plastic dolls, gold jewelry, hanging from the ceiling like chandeliers. In all its joy and sorrow, Salvador is a treasure chest dumping ground of stolen riches from Portugal and other parts of the world. A cradle for African rituals expressed by the perilous human condition marking the colonial era. Blood is smeared on cobblestone. Footprints are wiped after pilgrimage. Pockets of deserted white sand lapped with turquoise water are revisited. Beyond Salvador’s witness to all three, hides greater truths waiting to be unfolded. © 2011 Alice in Words. All Rights Reserved.